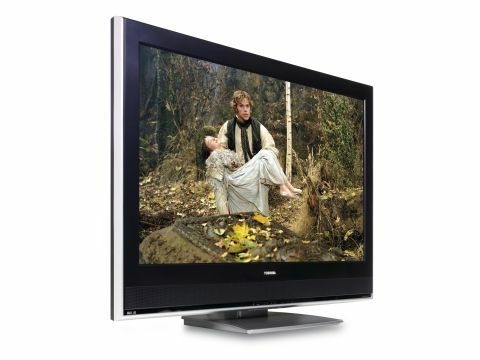 Toshiba's 42in 42WLT66 is unique in the LCD world in that it's a full HD TV, but it sits lower in Toshiba's LCD range than a series of 1366 x 768 sets. Still, we're not complaining, as this odd range position means it costs just £1,300: seriously cheap for such a large full HD TV. Aesthetically the 42WLT66's matt black finish contrasts neatly with a silvery trim, though the overall effect is perhaps a touch too subtle to stand out from the crowd. Connections include two HDMIs, the de rigueur component video jacks, plus the handy PC VGA input and a common interface slot. This latter port alerts us to the presence of an onboard digital TV tuner. The TV's other key feature is Toshiba's Active Vision LCD processing. This boosts a plethora of image elements, including contrast, colour, motion handling and fine detailing. A rather dated looking set of onscreen menus (navigated using a sluggish remote control) play host to a fair raft of picture and sound adjustments. Highlights include a 3D colour management system that can optimise image settings for displaying computer graphics as opposed to video, MPEG noise reduction for reducing the blockiness in some digital broadcasts, and a manual backlight adjustment. The 42WLT66 will happily show 1920 x 1080 hi-def sources on a 1:1 basis with no overscanning, but sadly it won't take 1080p. This won't be a trouble for watching HDTV, as this is broadcast in 1080i, but the Sony PlayStation 3, and HD DVD and Blu-ray players won't be able to show their pictures at their best. Set to work on our The Brothers Grimm test movie, the 42WLT66 is a slightly mixed performer. The set's biggest strength, unquestionably, is its fine detail response. The beautifully detailed shots inside the evil witch's tree house look remarkably full of texture and depth as a result, delivering exactly the sort of hi-def impact we'd hope to see from a full HD TV. The 42WLT66 also delivers exceptional subtlety of colour blend (due to its full HD pixel density), and sports an unusually wide colour gamut too. What's more, it presents its hi-def delights with very little video noise of any sort. This TV does have one rather key flaw, though: its black levels. Dark shots like those down the village well have a blue undertone to them that flattens dark scenes out and makes them look a touch unnatural. Furthermore, this bluish undertone slightly hides the rich details director Terry Gilliam has packed into film's backgrounds. As the Brothers wrestle with the enchanted trees, meanwhile, we also detected small traces of motion smearing - and this smearing escalates in intensity quite dramatically while watching standard-def sources, making it one of the weaker non-HD performers around. The 42WLT66's sound is on a par with similar sets: clear and rich enough to do fair justice to The Brothers Grimm's action scenes and rich score, but not quite up there with the TV world's brightest audio stars. If you intend to feed your new TV a mostly hi-def diet, and money's tight, the 42WLT66 is worth a look. But if you're after more of an all-rounder and your budget can stretch to them, other contenders in particular are better bets.